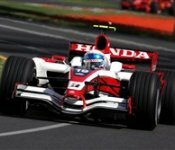 Takuma Sato, former driver of Honda and Super Aguri and currently in the running for a Toro Rosso seat next year, has become father for the second time. His wife gave birth to a baby girl of whom the name is not yet known. A statement of Takuma's personal websites noted: "Takuma Sato is delighted to announce the birth of a baby girl at Princess Grace Hospital Centre in Monaco at 15:50 on 30 September 2008. "The baby weighed 2740g (6lb), and both baby and mother are in good health."